The import file can be formatted using the CSV (comma separated value) format or Excel XLS and XLSX. The column headers in your file (CSV,XLS,XLSX) should contain the name of the Active Directory Attribute you want to add the data to. A list of column headers/attributes can be found below. The columns can be in any order and the column headers are not case sensitive but obviously must be spelt correctly for the program to recognize them, if it comes across a column it doesn’t recognize it will ignore that column. In the example shown below I’m using Excel to construct the file and using wildcards to speed up the creation of the file. The first row (1) contains the column headers, these are the attribute names such as givenName (first name). You don’t need to use all the attributes names just those you need, the minimum required to create a new users are shown below. This example file would create 5 new users. You can use a SQL Server database or an Oracle database as your data source, below are two example connection strings for connecting the AD Bulk Users to MS SQL or Oracle. Below are some example connection strings. Enter the connection strings by clicking Open Database in the Main ribbon or via the Scheduler. 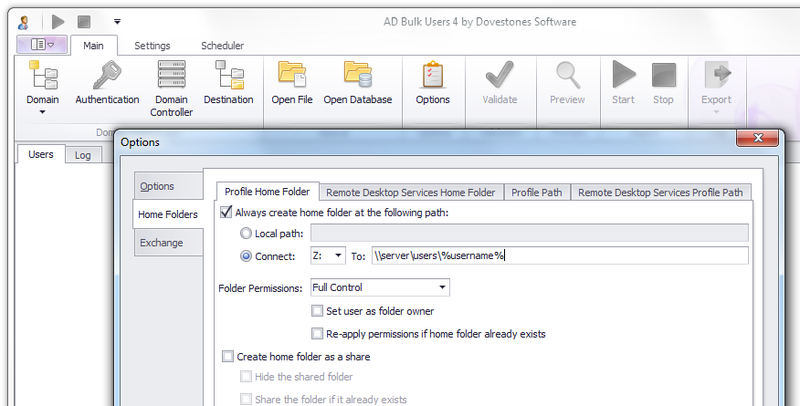 AD Bulk Users can be used to update/modify existing Active Directory Users. This is done by adding the column header ‘Modify’ to the import file and setting the value to ‘TRUE’. To update the ‘description’ and ‘telephoneNumber’ attributes for 5 users you would use a file (saved as CSV or Excel) similar to the example below. The sAMAccountName (username) is used to locate the user in Active Directory, the Modify column with a value of TRUE tells the program to update an existing user. The other columns\attributes are those to be updated, in this case description and telephoneNumber. If you want to update many attributes at once you can, simply add the additional column headers to your import file. For example: sAMAccountName,Modify,description,telephoneNumber,initials,employeeID,password. AD Bulk Users contains a built-in scheduler so you don’t need to use the command line to automate imports but if you prefer to use the Windows Task Scheduler or have another reason to use the command line you can. Use ADBulkUsersCLI.exe from the command line. You can find the syntax and command line examples for ADBulkUsersCLI.exe below. To speed up the creation of your import file/table you can use wildcards throughout your CSV file or table. You can create your own wildcards by clicking Wildcards in the ribbon. 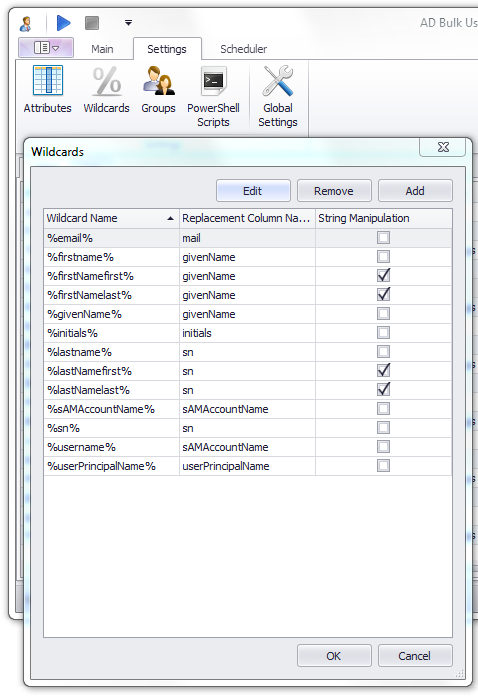 To create a new wildcard click the ‘Add’ button then enter a wildcard name such as employeeID and then select a column that the wildcard will read. You can use a Regular Expression if you want to manipulate the value such as reading the first or last character. To set the users Home Folder add the column header ‘homeDirectory’ to your import file, the value would be a UNC path e.g. \\server\share\%username% (the wildcard %username% will insert the sAMAccountName value), to set the drive letter to be mapped on logon use homeDrive with a value like H: or P:. You can use a local folder such as “e:\User1” by using homeFolder column with the local path followed by a semicolon and the drive letter, e.g. E:\homedrives\;z:. The program can create the home folder whilst creating the user, use the column createHomeDirectory with the value set to True, this requires the homeDirectory column. The program will create the home folder within the share specified in the homeDirectory value, for example if the value is \\servername\Users\%username% then the program will create the a folder named jsmith (username is jsmith) with the share ‘Users’. By default the user will have Modify permission to their home folder, you can change this to Full Control under Options\Home Folder. An alternative method of creating home folders is to specify the path and drive letter under Options\Home Folder, this give you some additional options. Under Options\Home Folder you can specify the permissions used and the option to create the home folder as a share, if the folder already exists then the program can re-apply permissions if necessary. To create the users home folder add the column ‘createHomeFolder’ to your import file and set the value to TRUE for each user. To import users into multiple OU’s from the same import file add the property ‘destinationOU’ to your import file. An LDAP path placed in this field results in the user being imported into that OU. This overrides the ‘Active Directory Container’ OU found on the settings tab. If the user has a destinationOU value present in the import file then the user is imported into that OU otherwise the user is imported into the OU found on the settings tab. When using the managers sAMAccountName or employeeID the program will need to search AD for the managers distinguishedName so these lookups will be slower than using the distinguishedName. You can run PowerShell scripts after a user is created, modified or deleted and also at the beginning and end of the import. To add a PowerShell script click the PowerShell Scripts button in the Settings ribbon. To execute a script against a user, add a column named “PSScripts” to your file/table and enter the Script Name as the column value. To run multiple scripts separate each Script Name with a semi-colon. The script can contain wildcards. If an error occurs during script execution, the error will be shown in the log. It is possible to add additional and custom attributes to the program. Click Attributes in the ribbon to add a unlisted or custom attribute. **Columns in your file can be in any order and the column headers are not case sensitive. Below you will see the ‘Displayed Name’ which is the label used in Active Directory, the attribute name which you use as a column header in your file and an example value. You can find some sample CSV and Excel files here. Common Name cn Wildcards can be used here. Create Mailbox for User mailboxEnabled True, Required when creating a mailbox. Email addresses proxyAddresses SMTP:JSmith@doamin.com multiple addresses? Automatically update based on recipient policy AutoUpdateOnRecipientPolicy True or False (True if omitted), can be used in place of proxyAddresses. Mail-Enable User mailEnable* True or False *Do not use with mailboxEnabled. External Address targetAddress Required when mail-enabling a user. Disable Mailbox mailboxDisable Remove the mailbox not the user. Disable Mail mailDisable Remove a mail-enabled user.